Lunar platter by Sweet Destructor, who rules. 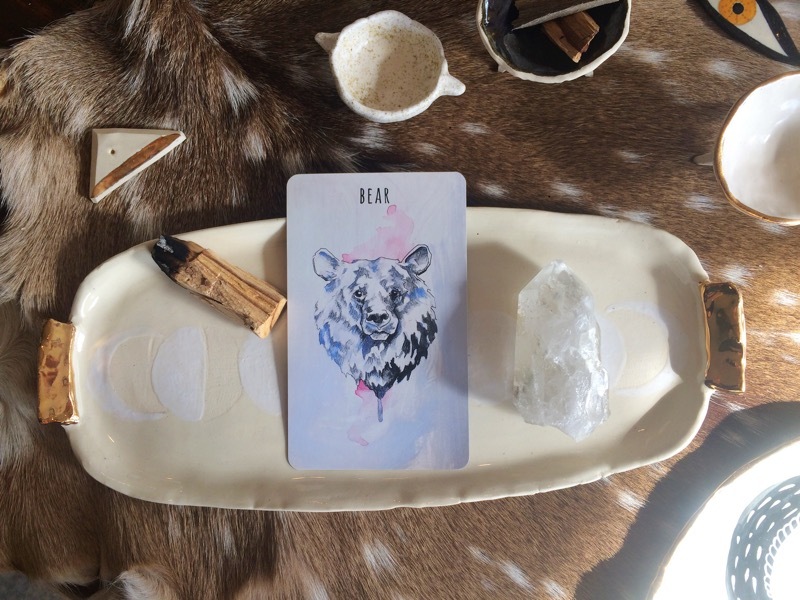 If you are among the lucky few who are not freaking out about financial strain, you may be wondering what else can the Bear mean for us in a reading? In a career focused reading it can mean that showing aggressiveness or strength is beneficial at that time so pull up your big girl pants and get at it! In issues regarding personal health, it usually signifies weight loss or gain - a good reminder is for you to think about how bears survive their Winter hibernation by gorging on food in the Spring. (This one is relevant to me personally, as yesterday was a *personal best* for epic snack consumption and napping). Oh, and the Bear can also represent a matriarchal figure as well, so call your mom. Finally, when romance is on the brain the Bear can signify a robust, even aggressive suitor, if you know one of those...maybe rethink things if your S.O. is acting possessive or pushy. Also, let us not forget the direct and even literal ways of Lenormand tarot communication, for you boys who like full-figured fellers, I've got good news - this card could mean a 'bear' for you! This is also a bear. *These three card readings are intended for us all as a community and are therefore broad. If you are interested in a more specific, in-depth reading - we offer individual readings at Oracle as well! If you would like to schedule an appointment for an individual reading, you can do that here or give us a ring at 816.982.9550. You can also join us for one of our monthly Tarot Workshop & Happy Hour events and learn more about cartomancy!